I was back on the CBC TV suppertime news last night. 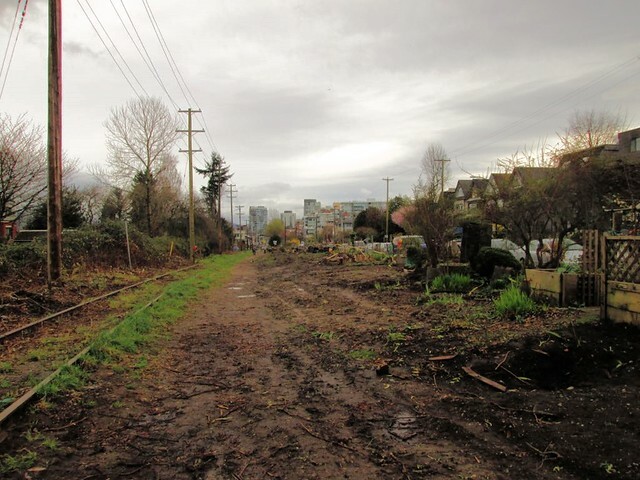 CP have sent in the bulldozers again to restart the work on their long disused track from Marpole to Burrard Bridge. They are down at the south end of the line now, back where they were ripping out gardens last year before the the City tried to get an injunction to stop them. Unsurprisingly, the courts were reluctant to stop CP from trying to make their tracks capable of carrying trains again. Except, of course, there is no reason for CP to do so: not one that makes any commercial sense that is. CP are not interested in carrying people: they are freight railway. There are no customers now on the line. That is why there have not been any trains: for years. 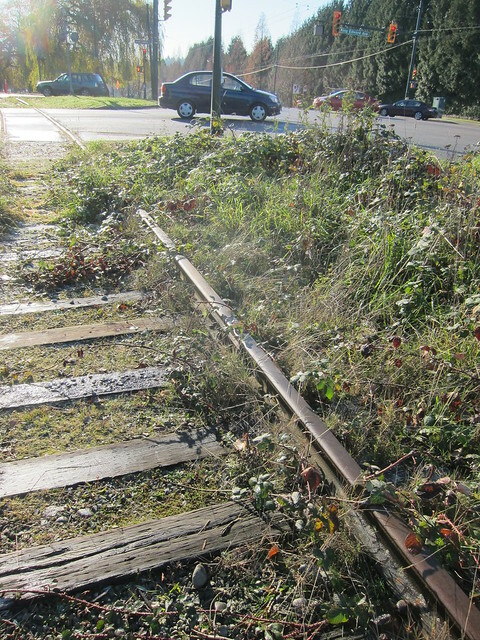 The track has simply been left to return to nature. 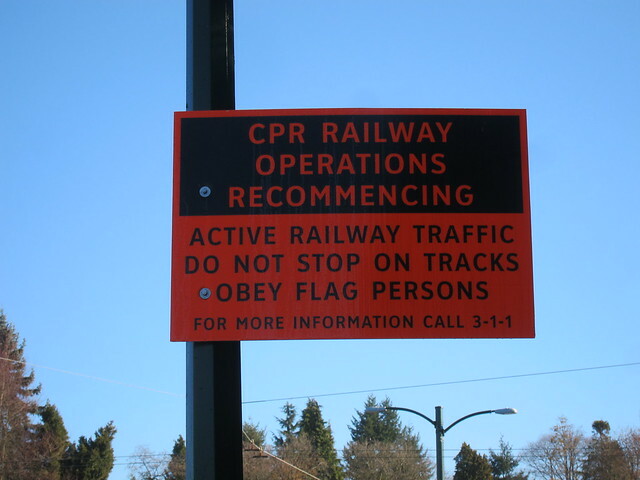 CP is obliged to maintain the road crossings as it has not formally abandoned the track. But the only reason it is clearing away encumbrances is to try to get the City to raise its offer. 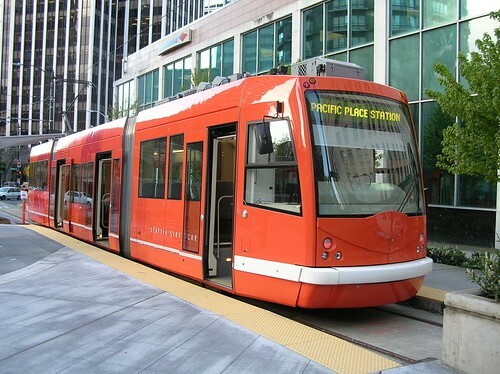 The corridor is designated for transportation use in the City plan. That also was established in court. 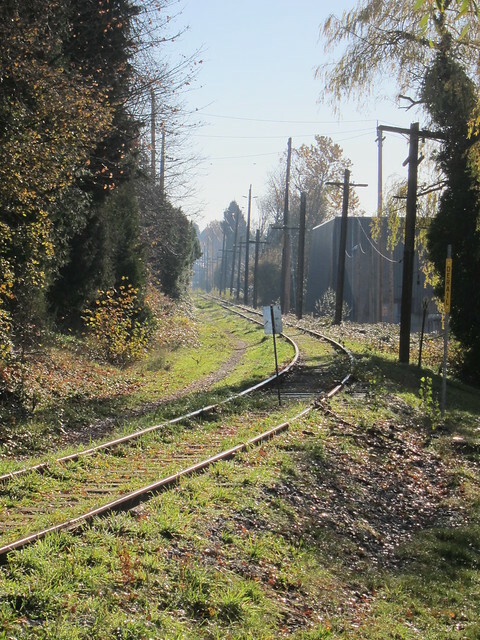 CP is not able to sell the land to developers, so the City is the only potential buyer. And they do not put the same price on that strip of land as CP does. I just created the map above: I was surprised that the City Boundary does not appear on Google maps so I added a very crude dashed line along Boundary Road. 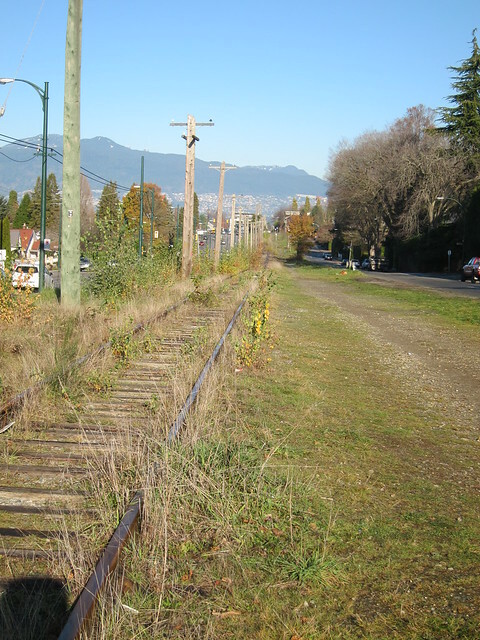 The map area to the left of that line is the City of Vancouver. You will note that Highway 1 also known as the TransCanada Highway and “the freeway” is to the left of the line too. Vancouver does have a freeway. Not very much maybe and it just runs through the north east corner of the City and for some distance in a tunnel. But it is a freeway and it is well within the City limits. Mike Harcourt was indeed instrumental in making sure that a freeway was not built through Chinatown – and downtown. Well done Mike. I salute you. 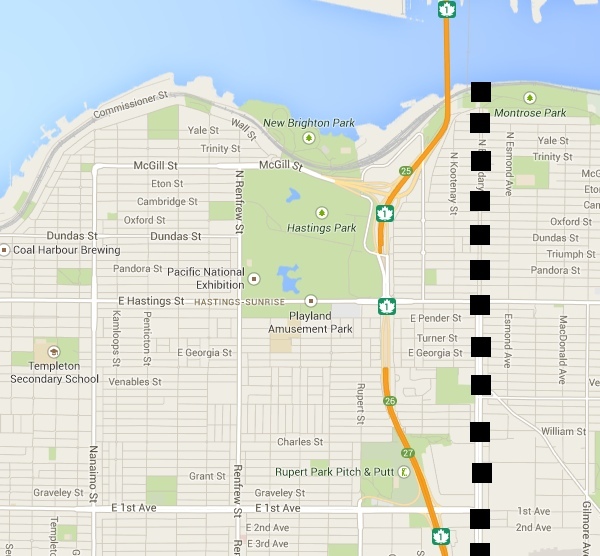 But that does not mean that Vancouver is without any freeways at all. As you probably know I do not live – and therefore vote – in the City of Vancouver. But I am very much in favour of car free streets. I administer a flickr group called “places without cars” to collect pictures from around the world of urban areas that have stopped cars coming into streets – either temporarily or permanently. And written about it here quite often. 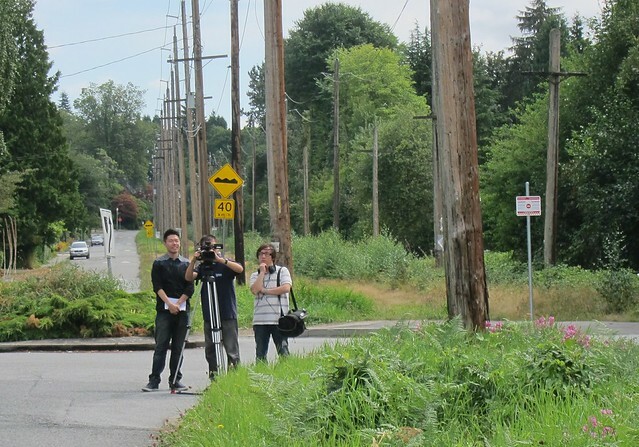 So when three candidates for the Vancouver council election start talking about it, I am all attention. Go now to Andrea Reimer’s site and learn more. I am not going to endorse candidates but I do feel that it is time for some more progressive attitudes to be represented at City Hall. 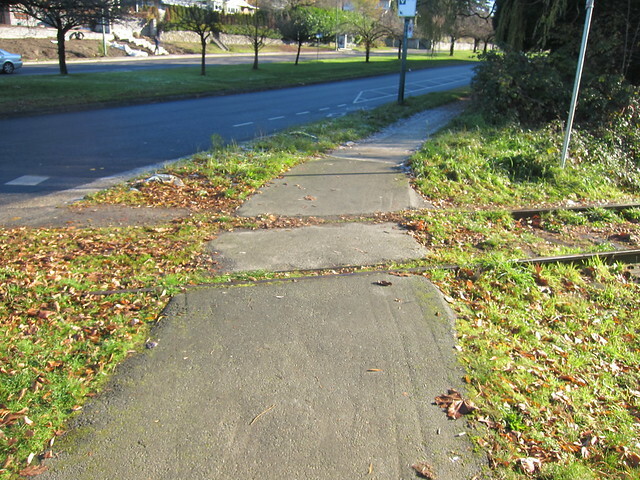 And from my experience of dealing with them (which admittedly is now getting a bit dated) the City Engineers are not exactly cutting edge on this kind of issue. Which means the new councillors – if they want to see this kind of change – are going to have to be pretty determined to stand up to groups like the very pro-car DVBIA. And if you want a really well informed blog on the City of Vancouver election Frances Bula (formerly of the Sun) is now on the hook as well as her own blog.